Many of us, feeling under the current stormy political weather, find ourselves facing uneasy choices regarding the future of society and the freedoms of the country that we have long taken for granted. But don’t worry; I’m not about to launch into a pretentious little rant here. Rather, I’ve prefaced this blog entry with the above statement to demonstrate that while our technically enhanced, media-driven political and social conflicts may often seem new to us, this week’s Torah reading, Parashah Ki Tavo, relates how very old they are; for they only serve as new disguises for those ancient energies of good and evil. 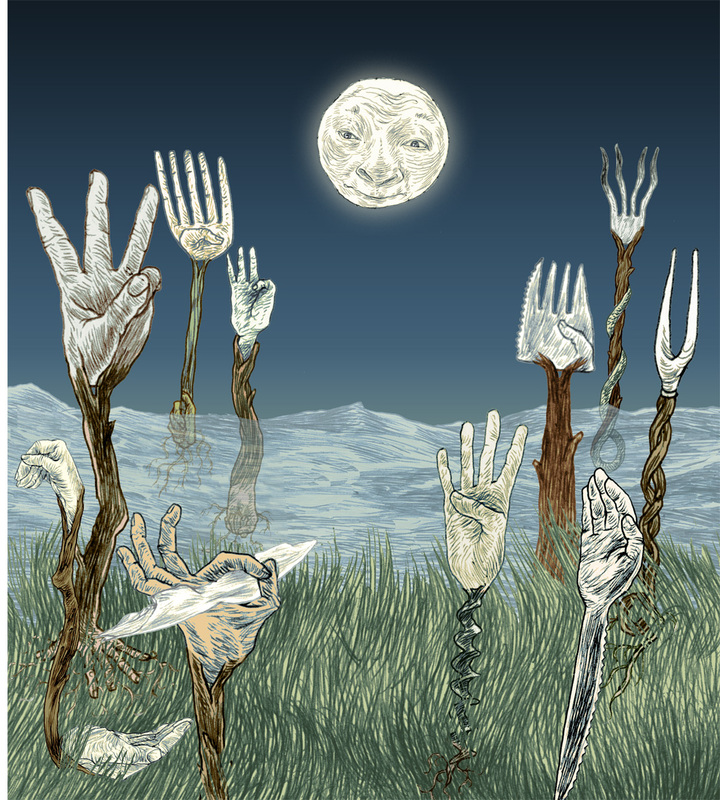 Through mnemonic devices that include blessings and curses, we find a clear explanation of how our ancestors were given an understanding of these energies and an opportunity to choose between them in every decision and action. 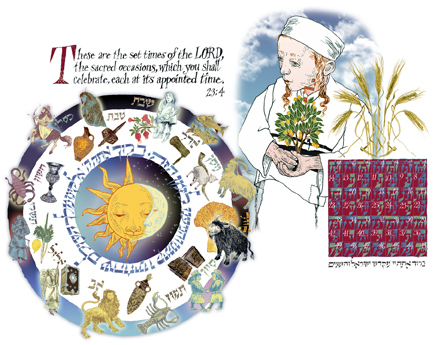 The illustration above, Of Mitzvot & Mezuzot precedes this choice. 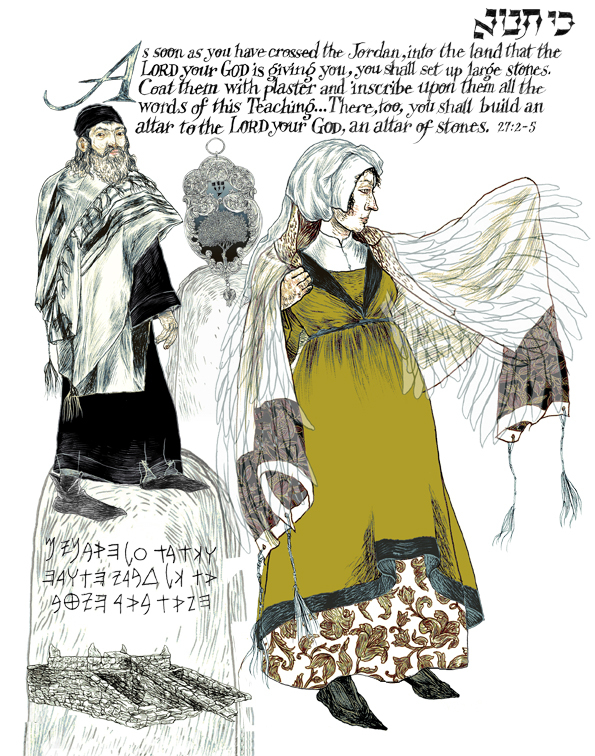 Here, a man and woman are each wearing a prayer shawl (tallit), a mnemonic device for remembering the commandments. 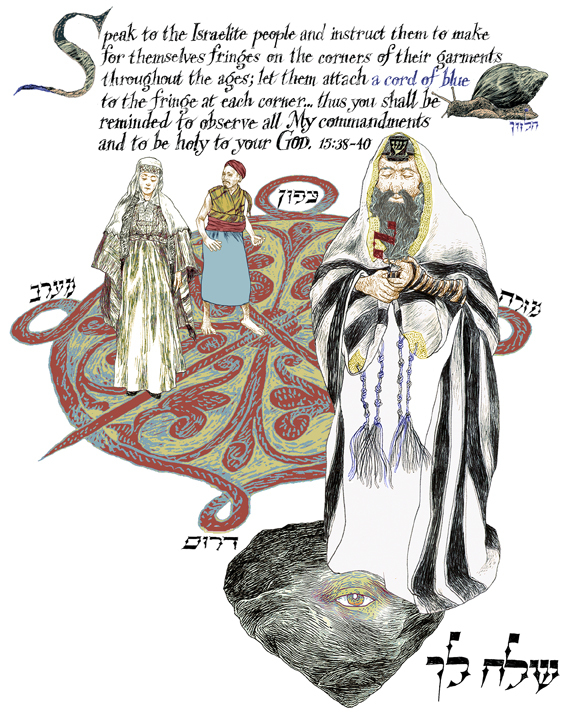 Through the use of gematria, the Hebrew system for number interpretation, the medieval French rabbi, Shlomo Yitzhaki (Rashi), suggests that a tallit’s ‘tzitzit’ or fringes descending from its four corners represent the 613 commandments or mitzvot. In this system, the Hebrew letters for the word ‘tzitzit’ (as spelled in the Mishnah) accrue a value of 600, to which 8 and 5 (representing the strings and knots respectively) are added for a total of 613. 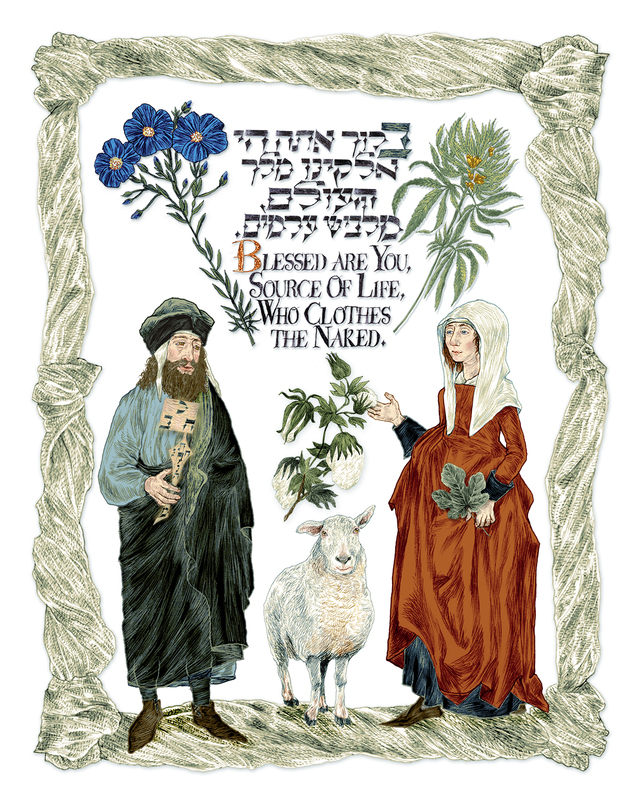 In a nod to Kabbalistic philosophy, the colors of the man’s tallit, black for Gevurah or strength and white for Chesed or lovingkindness refer to those sephirotic valences. The shadowy wings within the woman’s tallit are meant to symbolize her spiritual connection to the Shekhinah or the feminine aspect of G-d.
Parashah Ki Tavo aptly translates as ‘when you enter’, because just after crossing Jordan, before the Israelites are to enter the Promised Land, Moses and the Levite priests instruct them to set up a series of large stones, or stelae, coat them with lime or plaster and inscribe on them ‘every word of this Teaching most distinctly‘. The inscription on the stelae is a portion of the parashah quotation written in paleo-Hebrew and based on the Moabite stela of King Mesha dated from 850 BC. Though this method may have preserved the inscriptions better than carving them directly into the stones, preservation did not appear to be of prime importance. According to 15th century Spanish bible commentator Don Isaac Abravanel, Moses may have been concerned that like pagan conquerors, the Israelites might choose to erect a monument to their conquest without acknowledging G-d’s role in it. So he made it plain that these stelae, or massive mezuzot, if you will, were to commemorate their commitment to God and His Commandments. 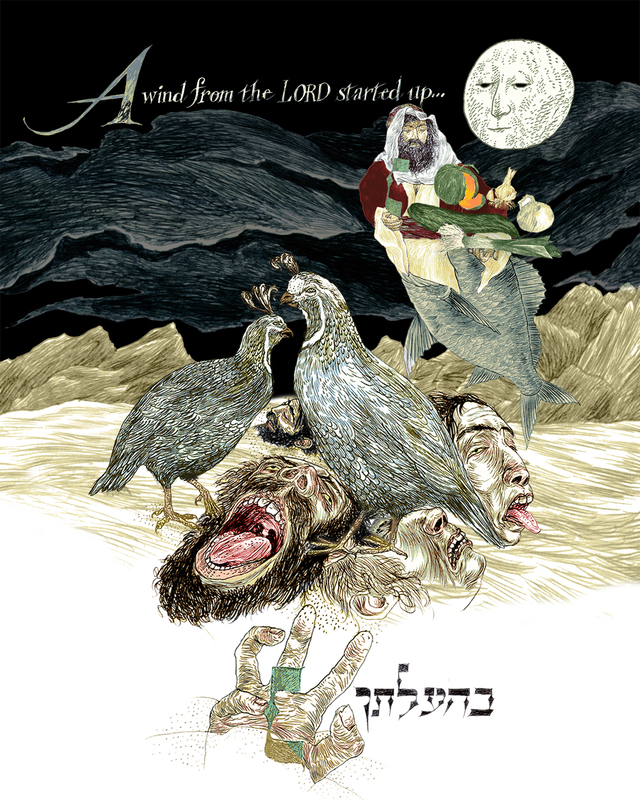 It is not clear whether the writing was to include all of Torah, or only the final book. Neither, concludes Sa’adiah ben Yosef Gaon, the eighth century rabbi and philosopher. He posits that only the 613 mitzvot were written on the stones because while all of Torah is important, the mitzvot are commandments related to blessings and curses that are connected to direct action. Within the inscribed stele at the lower right of this page is an image of the altar that the Israelites were required to build on Mt. Ebal using similar stones. Because the altar would serve a holy purpose, iron tools, normally used for weapons were prohibited in its construction. The small decorative mezuzah, seen behind the woman, suggests a modern parallel to those original monuments. Traditionally, a mezuzah is a sort of amulet attached to the doorway of a Jewish home that contains a tiny specially prepared sheet of parchment called a ‘klaf”. Portions of the Shema (the core prayer in Judaism) are written on it in Hebrew. 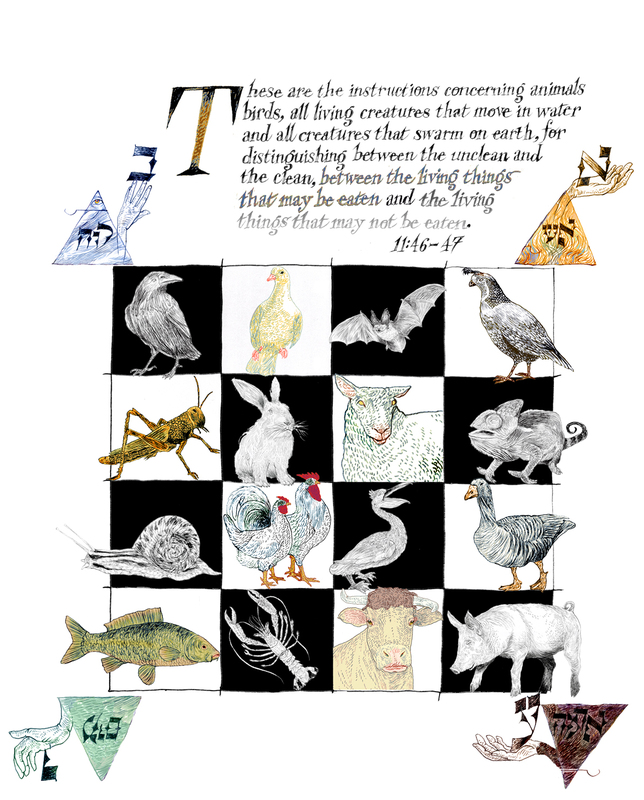 In The Consequences Of Choice, shown below, are representatives of Israel’s twelve tribes, six from each. After raising the stelae, these leaders were then instructed to position themselves on two facing mountains separated by a valley. 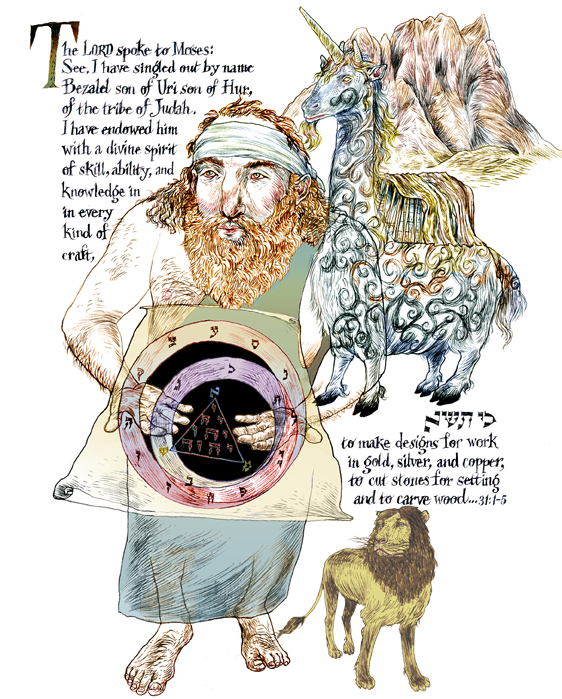 The color of each figure is based on their associated gem set into the choshen (breastplate) of the Kohen Gadol (High Priest). From the valley between Mts. 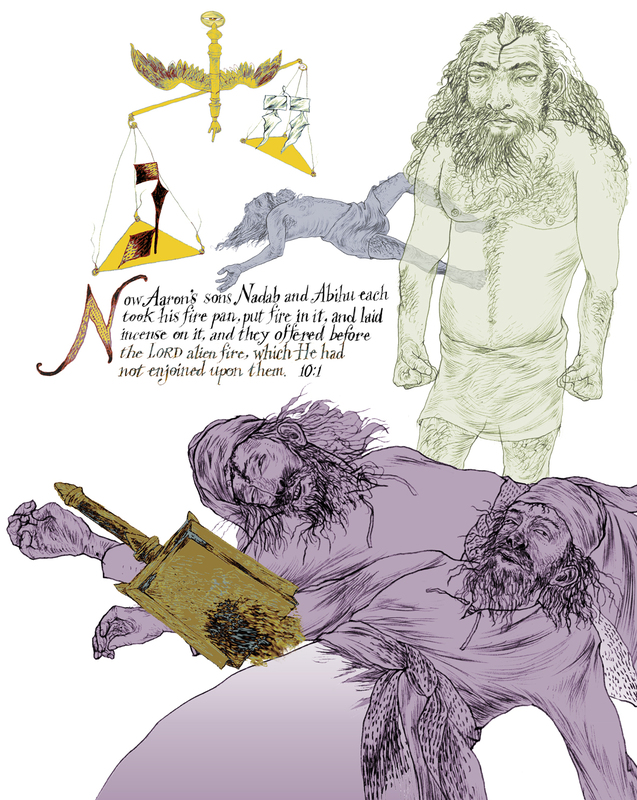 Ebal and Gerizim, with Ark of the Covenant in full view, Moses and the priests called out to the tribes, alternating between blessings and curses to reinforce their understanding of good and evil and to ensure that the boundaries between them would never be breached. This understanding was a major prerequisite for settlement in the Promised Land. 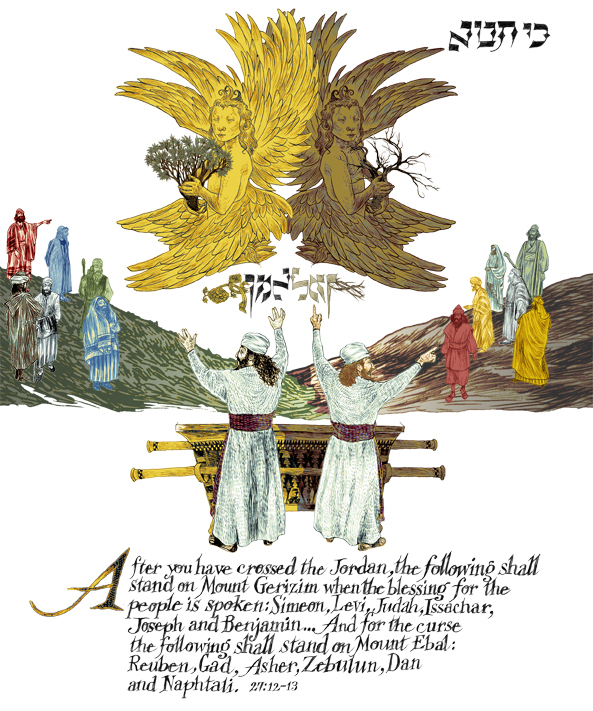 Hovering above this tableau, two keruvim (cherubim), each holding a tree are facing away from each other in contrast to their position atop The Ark Of The Covenant to emphasize the discord that ensues when good and evil actions become indistinct from one another. 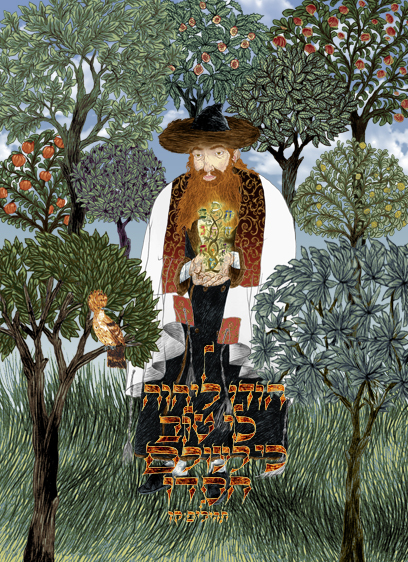 The left keruv’s luxuriant tree represents blessings or fertility when the Laws are properly implemented while the right keruv’s barren tree signifies the curses that will come to pass when the Laws are disobeyed. Finally, the word ‘Amen‘ is seen above the priests because when we say ‘Amen‘ after a blessing, we are binding ourselves in the light of that blessing and strengthening the bridge between the Upper and Lower worlds. The word ‘Amen‘, calligraphically depicted in its positive and negative aspects emphasizes the tribes’ clear understanding and acceptance of both blessings and curses. Though I have only one vote in this approaching election, I can only hope that we, as citizens of this unique land, will vote together to ensure that its outcome benefits the physical and spiritual needs of us all; rich, poor and in the middle; for it will define us as standard bearers of the balance of good and evil for future generations.